Dublin, Ireland: 21 March 2017: NVMdurance, with its unique approach to extending the endurance of flash devices and enabling 3D NAND, has announced that patent number 9,569,120 developed by Joe Sullivan and Conor Ryan, both of Limerick, Ireland, has been granted in the USA for Adaptive Flash Tuning. 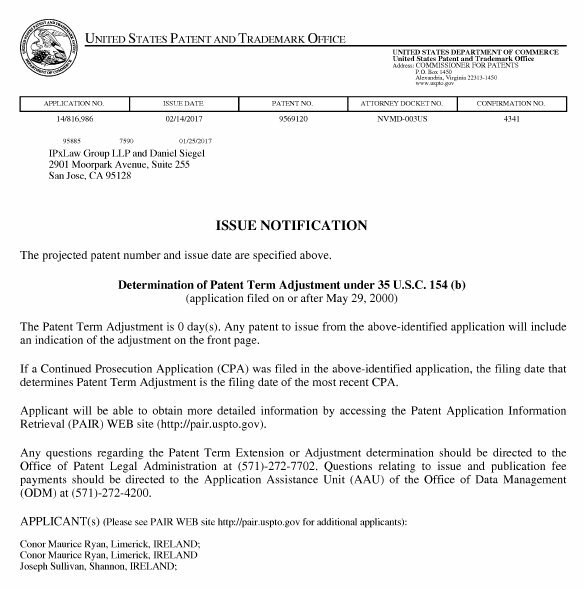 This is the fifth patent granted by NVMdurance, founded in 2013. The first was granted in the USA in 2015. Two others have been granted in USA (US Pat No 8,984,210 and US Pat No 9,262.319), one in China (ZL 20`0 8 0052625.2; NVMD-002CN), and one in Ireland (S85799). This patent covers NVMdurance Pathfinder and Navigator software, which discover optimal flash trim sets for the target application and implement a set of optimization techniques that constantly monitor the NAND flash health and autonomically adjusts the operating parameters in real time. NVMdurance software ensures that the flash lasts as long as possible without disclosure of “test” mode” information from the flash manufacturer. In an offline characterization phase, ‘test chips’ from a batch of recently manufactured flash memory chips are used to simulate various usage scenarios and measure the performance effects of writing and attempting to read test patterns written with different sets of operating parameters over time, simulating desired retention periods. Flash memory is used to store data in Solid State Drives (SSDs), mobile phones, tablets and many other applications. NVMdurance has the world’s only automated solution for characterizing flash memory, which enables suppliers and adopters of flash to improve reliability, accelerate their deployment of new types of flash, differentiate their solutions, and optimize around customer usage conditions.